Well….Finlandia Trophy was my fifth ISU B event that I’ve watcрed this season) I feel almost like Elizaveta Tuktamysheva in her winning season. Yeah, I’m very proud of myself. I’m not joking, watching first warm-up it’s not for the faint-hearted. But the Finns started with the interesting – pairs. Otherwise there was a risk that I would go to the kitchen to make some tea…..for couple of hours. From competition to competition I like Astakhova-Rogonov‘s programs more and more. Either all this theatrality distracted me from all their strengths, or the guys really progressed. If only they did fewer mistakes…….and took off this yellow tie. She has a yellow dress, I get it, but this is not an excuse for wearing such an accessory. I liked both program of Lyuba and Dylan. They are lovely, stylish with interesting small choreo things. But not for Olympics. Ok as an experiment, but not with such programs you approach the main competition of the four years and the peak of your careers. I expected much more because they have everything for that. Setting aside the fact that version of Besame much could have been better, I will say that Stolbova – Klimov has a chic short program. Mature, spectacular … ..and sinister. For some reason this word came to my mind first after their performance. Oh, and they traditionally look hot and damn stylish. It’s hard to say anything about the free program, except for the banal “It’s good that it’s only shoelaces, not no health problems.” But I take off my hat to Ksenia’s fearlessness. To jump into the last lift, having failed the two previous ones … ..you need to have steel nerves or an absent sense of self-preservation, or better both. So, it’s a traditional Carmen. For some reason I thought that they would take risk of going to modernity and doing something like black Carmen of Tessa and Scott. This time I was morally ready to contemplate Matteo Guarise in this tight-fitted jumpsuit and with this hairdo. This time, at least I managed to clearly see the programs. Beautiful programs, by the way. The Italians almost create a mini-sensation. If their free program had been a little more “magnifico” they could have won the competition. The fact they actively take consultations from Nina Mozer would have added some extra piquancy to this situation. Tango by Chinese Peng – Jin is very cool in choreography, it is clear that it was made by a professional. Surprisingly it suits them. The pair turned out diverse. But the guys was a bit unlucky to skate after the Russians. After Ksenia and Fedor their very good tango looked a bit juniorish. In execution, not choreography. But all the elements were chic. And where did everything go in the free program? I could barely look it till the end, the whole second half I was picturing how good this gold medal would look on Matteo’s strong chest.) In your dreams, darling, the judges told me and the medal remained with the Chinese. After the Italian close ups, yawning Slovak cameraman and advanced German stream it seemed unrealistic for the Finns to surprise us. But they did. They added some heat in the winter sport. Men‘s free skating were with smoke and fire. Literally. Fire alarm, frightened Chinese guy, evacuation, Adam Rippon corresponding from the scene of the events. A real blockbuster. In the season of mass returns to an old programs, Michal Brezina went further than anyone else) He brought back not the last season program, not even the program from this cycle. 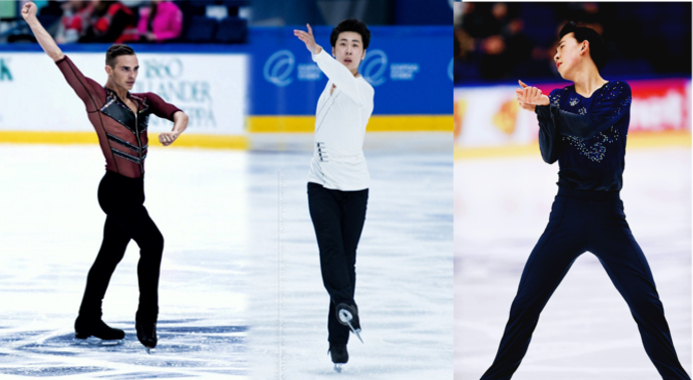 This short program is from the season 2010-2011. Actually, it’s my favorite Michal’s program. Even the costume looks as good as new one. His free program also passed without huge fails, already some kind of positive,….but only sixth place. So let’s learn to rejoice small things. Ross Miner skated something nive and even something not very dull. I don’t remember what exactly, but I remember that I liked it. Kolyada continues his jumps in standings. No, Misha, from 10th to 1st, as it was at Nepela, I liked much more. Adam, I was waiting for your Rihanna cover…..and where? But anyway you’re damn good) With no quad, all this smiles and winks and this shirt) No one can do this, but you can. Last season I really liked this free program and we haven’t really seen it much. So, I’m glad he kept it. Adam, where did you learn to make eyes like that? I need a master-class. And you know what? I see some progress in Boyang‘s skating, he’s trying. I like the short, although it seemed to me that he and Michal skate the same program. Either it’s a costume, or he really grew up and grew stronger, I think last season he was thinner. I do not know how it will affect jumps, but it’s good for his lines. Lori did his free program, right? Oh, she has something deeply personal against Chinese figure skaters. Yeah, I watched them all) And I’m a bit envy..such beautiful girls!) Australian Amelia Scarlett Jackson, Annely Vahi, the local beauty Emmi Peltonen ….. Unfortunately, beauties don’t like to jump. Honey, why do you need this figure skating, why spoil such beauty with bruises? Polina Edmunds looked the same…hard to watch without tears. And all this heartbreaking performance was to the symbolic song Time to say goodbye. Da Bin Choi doesn’t seem to remember that home Olympics are coming and someone should represent the host country. It’s time to open your inner goddess Yuna Kim at least for ten percent. What Gabrielle Daleman thinks about Olympics is also unclear for me. I did not expect to see her so unprepared. Injury? ( Then, probably, it was better not to appear in public such not in shape, because all the reputation of World Championships medalist can be lost. I liked her Carmen, but I expected more powerful version of Gladiator, because such lyrical style is not for her. Well done Alena! She hasn’t been skating like this for a long time! Love her Indian program, it’s much better than the one Nikolai did for her long time ago. Bright, colorful and tasteful. So I don’t understand how she could lose to Wang, whose programs I do not remember. Liza, Liza … .what to do with you, huh? In a short program you gave me hope that Lombardy was just an unfortunate misunderstanding, that Lisa would still fight for a place in Olympic team. And then we had a free program….such has never happened…and here again. Maybe, as an experiment, Mishin shouldn’t take her and Lazukin to competitions together….maybe it can help. I love Carolina, and the judges love Carolina. And I understand them. 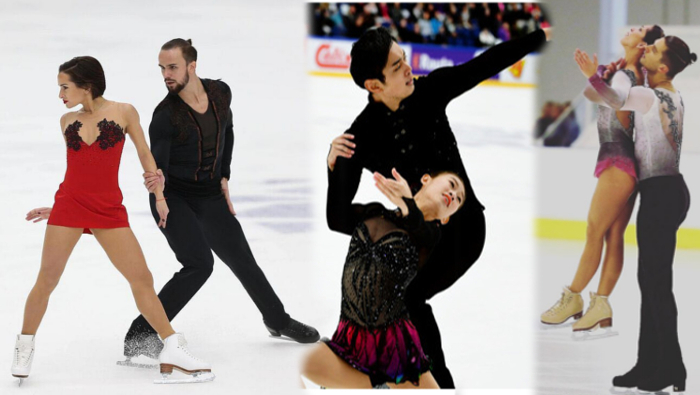 As well as their desire to support and motivate her and other figure skaters older than 20, to show that the modern figure skating should not develop only as a kindergarten. I understand all this in my heart, but sometimes it just too much. In Finland it was too much. Why? I don’t think she needs that. Again I really liked British pair. Very nice guys with lovely dances. Poor McNamara( Her first senior season doesn’t turn out well. First she lost to Smart-Diaz, then to Chinese and little-known Canadians. I’m worrying…I don’t want to see sad McNamara. who else will please me with emotions and experiments with mother’s cosmetic bag. After the extravaganza of colors and choreography in the past latina season, I waited for Chinese short dance with horror and trembling. And where? I do not play like that( Why everything is so modest?! He wears black. she has tender pink and beige dress…..and then my thoughts were heard) The beige pink skirt showed us black leotard. So the whole dance I was thinking what they wanted to say. Sara and Kirill. Their results and virtual loss to teammates Smart-Diar upsets me. They have good dances, it seems it wasn’t Zhulin who did the choreograpy). Although, I didn’t like lifts in FD, they don’t look suitable for ballet program and lack beauty of the pose. Oh and they dressed gorgeously. One of my favorite costumes by now. But something does not work out and one of them makes a mistake. Well, maybe at friendly competition in Minsk their scores will be more generous. Betina, Sergei, please do something with technique in the short dance! You’re such a great pair. I almost ready to call them “my favorite Russian pair”. For the freshness of impressions) And I will be extremely happy if Batina takes off this pea apron of Brazilian desperate housewife. Took third place in the free dance, beat Stepanova Bukin in tech (If I were them, I would try to avoid Tarasova in the near future) well done! Nikolaj Sorensen – my pain … .. Such a handsome man, but he always fails something( I wanted to relax, have a glass of vine and enjoy their free dance ….but mistakes came again( Oh, I’d love to see this dance performed by a different pair from Lauzon’s team. Does he want to bite her?) Or what’s going on? I don’t know why so many people thought that Papadakis and Cizeron will have problems with latina. Latina can be different. Languid, ballroom, passionate, playful etc. I like the stylistic direction they chose, it shows their strong sides. Surprisingly, I liked Gabriella in this dance more than Guillaume) But I want Guillaume to dress up. After Alexander Gazsi no one can surprise me wearing tank top) And Guillaume’s “costume” doesn’t match with Gabriella’s dress. The free dance is wonderful. That’s how an Olympic program should looks like. It is the result of their creativity and work in this four years. I can not say that the dance stunned me, no, it just lived up to my expectations. My high expectations. *Remark for fans of this duo: do not rush to throw slippers at me, it was a sincere praise* Perhaps the dance would have amazed me more, if last season they had risked and tried something completely different, then on contrast this dance would look even more impressive. Pleeease, can you also do Japan Open review? I love reading about your opinions and insights, you are so funny and smart person :) Thanks alot for your translantions and articles! It does not matter at all, I has been too greedy for your articles and your time! Let me thank you once again for this review of Finlandia Trophy. I enjoyed it greatly! I was laughing a lot while I was reading it! Also your gifs are the best! Thanks) Such comments means a lot to me. Maria looked beautiful and I loved both her programs! Loved the energy of Alena’s free program! Still waiting for Liza follow up on the promise of her Sochi skates.